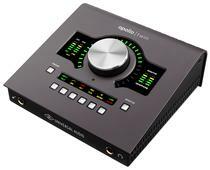 Next-Generation Audio Conversion with Classic Analog Sound and solo Core Processing. Built upon UA’s 60-year heritage of audio craftsmanship, Apollo Twin MkII starts with two Unison™-enabled mic preamps and the same next-generation A/D and D/A conversion found on UA’s flagship Apollo 8, 8p and 16. Together with its included bundle of UAD analog emulation plug-ins — which you can track through in real time with UAD-2 SOLO Core processing — Apollo Twin MkII is born to make records. The secret to Unison is its hardware-software integration between Apollo’s mic preamps and its onboard UAD-2 SOLO Core DSP Acceleration. Simply place a Unison preamp plug-in on your mic input, and tap into the classic sounds of the world’s most recorded mic preamps. With Apollo Twin MkII's Console 2.0 application — a complete re-imagining of Apollo’s original Console software — you can take advantage of over 25 user-requested features such as Channel Strip presets, Drag & Drop functionality, dynamically resizable windows, and more.